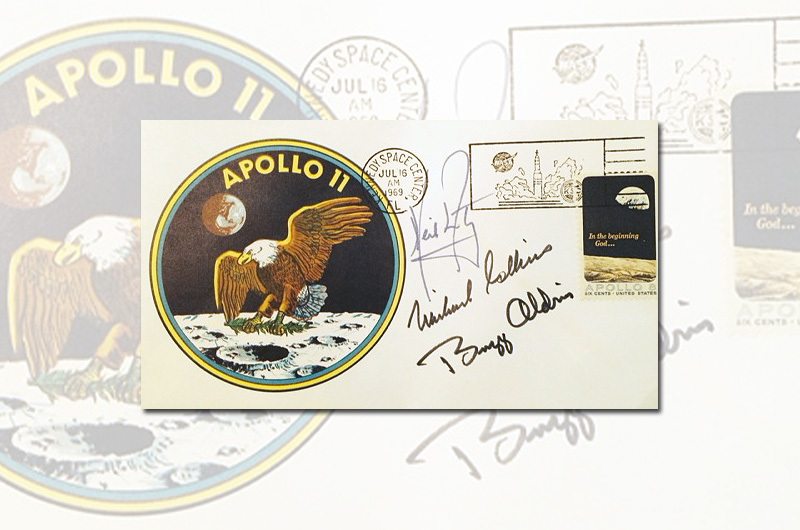 — When, 45 years ago, Neil Armstrong added his autograph to the envelope now featured in the Astronaut Scholarship Foundation's upcoming auction, he intended for its sale to provide for his family in the event he did not make it back from the moon. 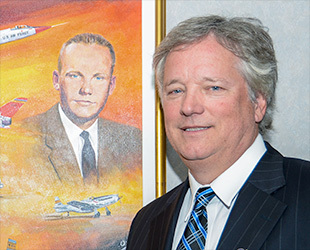 Now, more than four decades later, Armstrong's son has provided the rare memento to the auction so it can benefit the next generation of space explorers. "I hope that the proceeds from this donation will help the Astronaut Scholarship Foundation promote its mission of providing scholarship funds for students who are pursuing science, technology, mathematics or engineering (STEM) focused degrees, and advocating for STEM education in general," Rick Armstrong, the late moonwalker's older son, told collectSPACE. 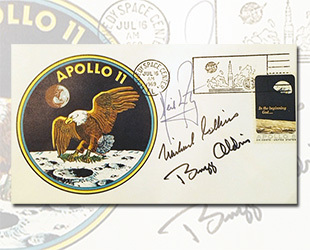 The prized envelope, which in addition to being signed by the Apollo 11 astronauts was also postmarked at NASA's Kennedy Space Center on the same day they launched to the moon, served as a kind of insurance. Armstrong, Buzz Aldrin and Michael Collins autographed a few hundred of the envelopes, which were distributed to their families. If the moon landing mission failed and the astronauts did not return to Earth, the crew's spouses and children could sell the signed envelopes to augment what the astronauts' life insurance policies provided. Of course, Apollo 11 succeeded. Neil Armstrong became the first man to walk on the moon on July 20, 1969 and he and his two crewmates returned safely to Earth four days later. Even so, their "insurance covers," as collectors refer to the envelopes, have become sought after as artifacts of the first moon landing. Over the past few decades, insurance covers from Aldrin's and Collins' collections have sold for thousands of dollars. Some of the cacheted envelopes have exceeded $10,000 at auction. But never has a cover, or for that matter, anything else, been offered for sale from Armstrong's personal collection. The envelope in the scholarship foundation's auction is the first to surface from the Armstrong estate since he died in August 2012. 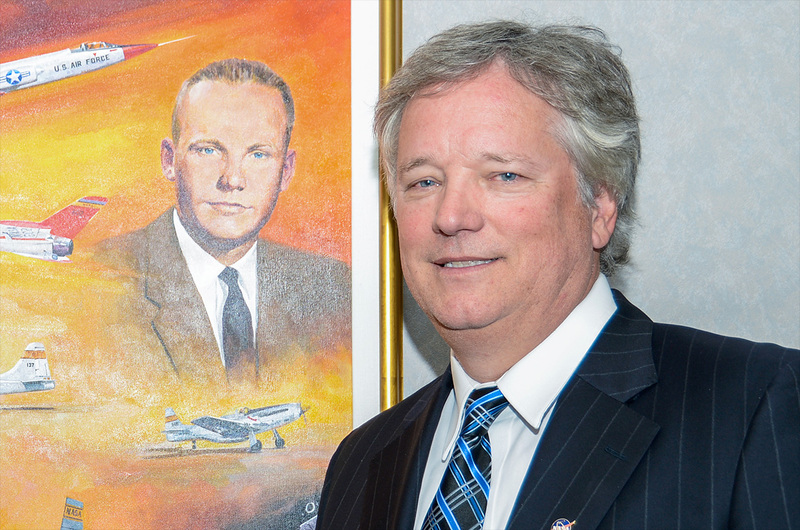 "It is an honor that Rick Armstrong chose to donate his dad's insurance cover in support of the scholars," Tammy Knowles, executive director of the Astronaut Scholarship Foundation, said. "Neil Armstrong and the Apollo mission inspired America. Rick's contribution continues his father's legacy by helping to inspire a new generation of innovators and explorers who will follow in his father's footsteps and lead America's next frontier." The Astronaut Scholarship Foundation, which was created in 1984 by the surviving Mercury astronauts, today funds twenty-eight $10,000 scholarships, the highest monetary award given to undergraduate students pursuing science and technology degrees based solely on merit in the U.S. To date, the ASF has awarded more than $3.7 million to students nationwide. A good portion of those funds have been raised through the foundation's biannual auctions, which offer rare space memorabilia and astronaut-led experiences. The current sale, which features the Armstrong insurance cover, will open for bidding on the foundation's website on Saturday (Nov. 1). The auction ends a week later on Nov. 8 with the last bids being placed both online and in person at the foundation's Astronaut Autograph and Memorabilia Show annual dinner to be held at the Hilton hotel in Cocoa Beach, Florida. 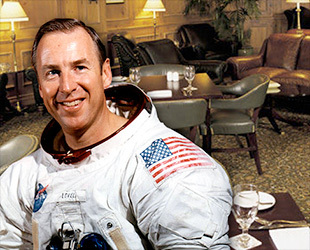 In addition to the insurance cover, the auction's 32 lots include a last opportunity to join Apollo 13 commander Jim Lovell for dinner at his family-owned restaurant in Chicago (Lovells of Lake Forest is closing in 2015); a makeshift ornament that in 1973 adorned the Christmas tree aboard the U.S. Skylab space station, the first Christmas tree in space; and a trajectory map for a space shuttle mission that never flew signed by 36 astronauts. The Armstrong insurance cover will open with a minimum bid of $15,000. The Lovell dinner opens at $4,500. Many of the other items' lots will begin at just $50. To preview the auction catalog or register to bid, see the Astronaut Scholarship Foundation's website.